Hugh McDonald is best known as the inventer of the McDonald Rolling Mill. 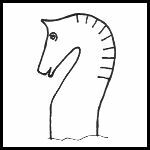 Hugh also forges a wonderful series of animal heads. His kangaroo heads are shown at the end of our review of his plans for his Rolling Mill. We will be demonstrating them and a Rams head next week. Note: Hugh did all the drawings. He is a retired draftsman and is used to doing INK drawings. Beautiful work and a pleasure for me to set up. HUGH McD. 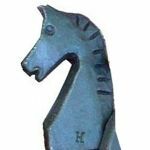 "This method of making forged animal heads is fairly quick but needs high heat and a heavy hammer for the early stages. My pet hammer goes 3.75 pounds (1700 g) but does in eight blows and one heat that my 2.5 pounder (1333 g) does in two heat and twelve or more hits"
HUGH McD. "You will need a hot slitting chisle, thin and sharp so you much quench it every few seconds to avoid softening it (NOTE: The high alloy non-tempering steel chisels are VERY good for this and not so subseptable to softening - guru). When working on your own, a hot cutter with the handle at right angles to the cutting edge makes it easier to see what you are doing. An anvil hold down is a must for any lone blacksmith." Figure 1 "Take a heat on the end of a 18" to 20" of 1" x 1/4" (25 x 6 x 400mm) flat bar and put it on edge about 1/8" beyond the far side of the anvil where it has a small radius. With heavy blows, round off the top corner taking care not to damage the small extension of the of the bottom corner that happens at the same time." HUGH McD. "This will become the ear (or ears). Before the heat is gone turn the work on its side and flatten the curve and draw it out for the mane." Figure 4 "Take a second heat and chop the lower jaw free from the neck. Cool the slitting chisel and put it back into the slit twisting it to open the head away from the neck. This is why I prefer a cutter with the handle at a right angle to the blade. Chop of the resulting point to form the the horse's muzzle (nose), taking care not to shoot this hot sharp bullet into your leg! You should still have enough heat to to put the muzzel down on a sharp hardie and form the mouth by smartly tapping the back of the head." 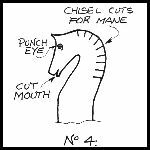 Figure 5 "Punch the eye and chisel the mane marks then dress the ear with a light hammer to your fancy. Wire bruch to finish." Figure 6 "This all takes longer to write than to do; depending on your heat source, less than five minutes. Now, have a think what to do with your little horse medallion." Figure 7 "The same procedure makes an excellent horse head in the round but is of course, more work; hot cutting the ears apart and making things more symetrical. To keep the head neat angle the cutter so that the surface under the jaw is square and all the slope from cutting is on the neck." 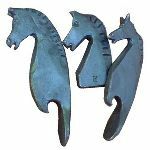 JOCK D Hugh makes bottle openers, letter openers, door knockers and other items using these heads. Next week will will do his "Roo" and rams heads. Questions, Comments? Note that questions to Hugh will have to be answered later and the answers posted, probably next week. Thanks for the demo. I noted stock size, but wonder how big head is when done? JOCK D The samples about are full stock width wide (1") so the head is about 1" tall out of equal stock. Bigger stock, bigger head.